See below for AMARC Correction to this CPJ Story! 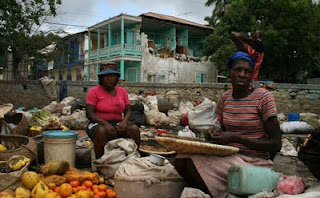 Women sell fruit in Jacmel, where Radio Fondwa was completely destroyed along with much of the city’s downtown. By Jean Roland Chery/CPJ Haiti consultant More than two weeks after earthquake that devastated Haiti, several community radio stations are still off the air. In the western and southeastern parts of the country, at least 16 stations are facing serious problems that have suspended their broadcasts, Sony Esteus, executive director of SAKS, a local organization of community radio stations, told CPJ. The earthquake obliterated SAKS’ office in the Bourdon neighborhood, east of Port-au-Prince. Community radio stations play a leading role in local news coverage in Haiti’s most remote communities, filling the void left by private radio stations in the capital. Most of them operate with low power transmission equipment—between 10 and 500 watts. Community broadcasters mobilise in support of Haiti Community radio broadcasters are mobilising worldwide in response to the earthquake that struck Haiti on 12 January. In an unprecedented global response in solidarity with the Haitian people, community radio broadcasters have organised appeals for emergency and humanitarian relief and have offered equipment and technical expertise to support Haiti's community radio stations. An AMARC volunteer team arrived in Port-au-Prince on Sunday carrying equipment for SAKS (Society for the Animation of Social Communication), a community media production and support centre in Port-au-Prince, whose offices were destroyed when the earthquake struck. Sony Esteus, Director of SAKS and AMARC Vice President, will accompany the international team as they travel to Leogane, Grand Goave, Jacmel and other locations that are among the worst hit areas outside of the Haitian capital. Radio Saka, the local community radio of Grand Goave, was reported back on the air, but at reduced power, and helping to mobilise local relief efforts. AMARC estimates around 12 community radios are in areas directly affected by the earthquake. The AMARC-SAKS mission will assess the impact of the earthquake on the community radio sector, provide basic repairs and support to community media workers, and assist community radio to contribute to the humanitarian relief operation. In the capital, most neighbourhoods have been heavily impacted. Many hundred thousand people have been left homeless and there are thousands of temporary camps. Everything happens in the streets. "The streets are the 'salon' of the people" says an old Haitian proverb. This has become a reality, even for those whose homes have not been damaged or destroyed, with people preferring to sleep in the open rather than risk staying in a building that might collapse with the next aftershock. Even the radio stations are broadcasting on the streets, with journalists afraid to work in their studios Major international media support organisations are on the ground working to help restore Haiti's damaged communications infratructure: AMARC, International Media Support, Internews, Reporters Without Borders, are among the organisations collaborating in Haiti to avoid duplication and to assure an effective response to the disaster and the challenges of providing immediate relief. AMARC has called on community radio broadcasters worldwide to support the Haiti relief effort, not only by broadcasting humanitarian appeals, but also be providing equipment, technical support and other resources to enable community radio in Haiti to play a central role in assuring access to information and enabling the populations affected to communicate their needs and concerns. For news updates, further information and offers of equipment, technical and other support to assist community radio in Haiti, please visit: http://www.amarc.org/haiti Through service to members, networking and project implementation, the World Association of Community Radio Broadcasters AMARC, brings together a network of more than 4,000 community radios, Federations and community media stakeholders in more than 115 countries. The main global impact of AMARC since its creation in 1983 has been to accompany and support the establishment of a world wide community radio sector that has democratized the media sector. AMARC advocates for the right to communicate at the international, national, local and neighbourhood levels and defends and promotes the interests of the community radio movement through solidarity, networking and Cooperation. More than two weeks after earthquake that devastated Haiti, several community radio stations are still off the air. In the western and southeastern parts of the country, at least 16 stations are facing serious problems that have suspended their broadcasts, Sony Esteus, executive director of SAKS, a local organization of community radio stations, told CPJ. The earthquake obliterated SAKS’ office in the Bourdon neighborhood, east of Port-au-Prince. Community radio stations play a leading role in local news coverage in Haiti’s most remote communities, filling the void left by private radio stations in the capital. Most of them operate with low power transmission equipment—between 10 and 500 watts. SAKS has a network of around 30 community radio stations throughout Haiti and has made bringing them back into operation its priority. Esteus, also a 1992 CPJ International Press Freedom awardee and the Caribbean representative of the World Association of Community Radio Broadcasters, said the premises of Radio Fondwa in the city of Jacmel and Radio SAKA in Gran Goave were completely destroyed by the earthquake. No casualties were reported, he said, adding that two Fondwa reporters who were in station’s studio when the earthquake hit escaped unharmed. In Petit Goave, Radyo Kolf Pye, a community radio station in the town of Value suffered great losses; in Leogane, the facilities of Radio Zetwal Peyizan collapsed, Esteus said. Esteus, an experienced radio reporter, worked for Radio Haiti Inter for almost a decade till the station was closed in 2003. During the military coup of September 1991, while he was working as a reporter for radio Tropic FM, he was imprisoned and beaten at the headquarters of the in Port-au-Prince police department, he told CPJ. If you have any information on journalists and media outlets in Haiti please go to Committee to Protect Journalists or notify via e-mail msalazar@cpj.org, or Twitter: @HelpJournalists. They are collecting funds that will go directly to Haitian journalists. Community radio broadcasters are mobilising worldwide in response to the earthquake that struck Haiti on 12 January. In an unprecedented global response in solidarity with the Haitian people, community radio broadcasters have organised appeals for emergency and humanitarian relief and have offered equipment and technical expertise to support Haiti's community radio stations. An AMARC volunteer team arrived in Port-au-Prince on Sunday carrying equipment for SAKS (Society for the Animation of Social Communication), a community media production and support centre in Port-au-Prince, whose offices were destroyed when the earthquake struck. Sony Esteus, Director of SAKS and AMARC Vice President, will accompany the international team as they travel to Leogane, Grand Goave, Jacmel and other locations that are among the worst hit areas outside of the Haitian capital. basic repairs and support to community media workers, and assist community radio to contribute to the humanitarian relief operation. Major international media support organisations are on the ground working to help restore Haiti's damaged communications infratructure: AMARC, International Media Support, Internews, Reporters Without Borders, are among the organisations collaborating in Haiti to avoid duplication and to assure an effective response to the disaster and the challenges of providing immediate relief. AMARC has called on community radio broadcasters worldwide to support the Haiti relief effort, not only by broadcasting humanitarian appeals, but also be providing equipment, technical support and other resources to enable community radio in Haiti to play a central role in assuring access to information and enabling the populations affected to communicate their needs and concerns. Through service to members, networking and project implementation, the World Association of Community Radio Broadcasters AMARC, brings together a network of more than 4,000 community radios, Federations and community media stakeholders in more than 115 countries. The main global impact of AMARC since its creation in 1983 has been to accompany and support the establishment of a world wide community radio sector that has democratized the media sector. AMARC advocates for the right to communicate at the international, national, local and neighbourhood levels and defends and promotes the interests of the community radio movement through solidarity, networking and Cooperation. Earthquakes are horrible. I had a friend who owns an seo software company who was in one, and he said it was terrible. i feel sorry for the victims of earthquake. I am praying for their safety.The services from the different country are helping them.